In This Moment started life as a metalcore band, but they’ve gradually transitioned away from most things hard and are now pretty much a pop band with metal overtones. This evolution has been an attempt to take advantage of the one thing the band has going for it: singer Maria Brink’s awesome voice. Ritual is their sixth album, and on paper is very enticing. The band is trying to move away from the overwrought production and arrangements of their last couple of albums, aiming now for a darker, more visceral approach – or at least that’s what they want us to believe. In reality, Ritual is more of a vehicle for producer Kevin Churko to show off all his tricks than it is for Brink to mesmerize us with her vocals or the band to wow us with great songs. “Salvation” is a blasé toss-off instrumental track that opens the album, leading into the gospel-like “Oh Lord,” which has oddly been released as a single despite not really going anywhere as a song. “Black Wedding” can be considered the first real song here, and it’s heavier, relatively enjoyable fare despite the blatant Billy Idol ripoff (“It’s a nice night for a black wedding”). It is also a duet with Judas Priest’s Rob Halford, but this has to be the most inconsequential guest appearance in history. Both voices are so drenched in effects that it doesn’t really matter who the vocalist is. One of my favorite In This Moment cuts is their energetic, aggressive cover of Blondie’s “Call Me.” Here on Ritual they want to pull off the same thing with Phil Collins’ “In the Air Tonight,” one of the best songs ever written. They don’t bring anything exciting to the proceedings, however, aside from more Churko production wizardry, and just make me go back to the original. There are poppier moments throughout Ritual, such as “Joan of Arc” and “Witching Hour,” and some heavier moments, where the band tries to come off as dark and angry, like on “River of Fire” and the closing track, “Lay Your Gun Down,” which are both strong. At times these efforts pay off, but not often enough. 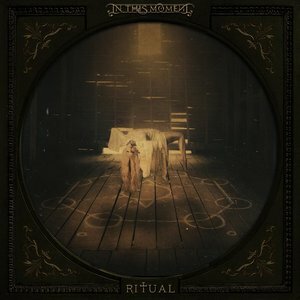 Throughout Ritual I was left with three impressions: first, despite aiming for commercial success, there aren’t really any songs here that stick with the listener. Second, this is an album much more about the producer than the band, and that’s never a good thing. And last, although Brink is one of my favorite female vocalists, she just sounds tired on this album. All told, Ritual is a disappointing release from a band I always hope for more from. Being a big fan of The Dream and A Star-Crossed Wasteland, I know they can deliver. It just doesn’t happen here.